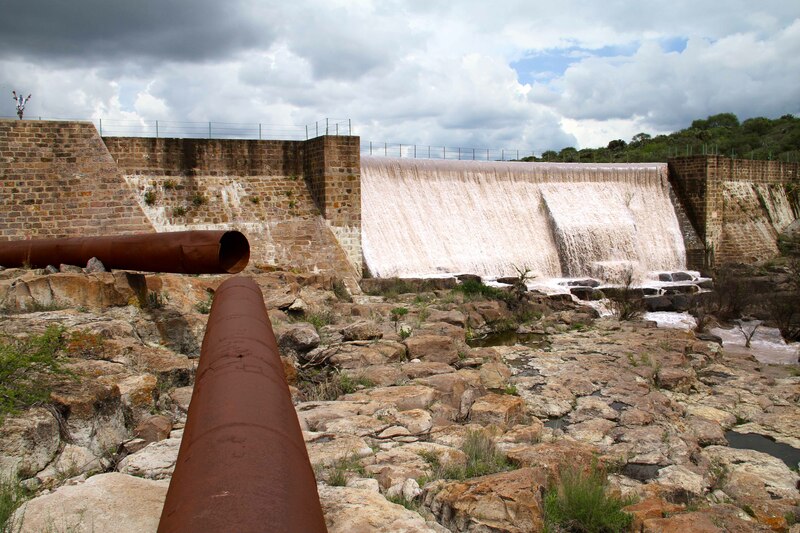 The pipeline, old El Conducto, originates at the dam in the nature preserve. It was originally built to pipe water to Fábrica la Aurora, a textile mill in town, where it powered generators that supplied electricity to the mill. That old textile mill now houses a complex of art galleries. This is another view of the dam from the side of the canyon that we are talking about. There is an overview photo of the canyon posted in the other blog here. Initially, when one starts out walking on the pipeline, it is a piece of cake for quite some distance. El Conducto looks like this at first. I would bet that my sweet, little 91-year-old mother could walk this stretch of the pipeline if she were allowed to use her walker on it. Of course nobody would take that bet without insisting that she not be allowed to use her walker. She might be able to do it without her walker, but that is not a bet that I am interested in making. Consequently, there is no use in paying all that money to fly her down here to try and then having to keep picking her up out of the weeds and putting her back on the pipeline. At the end of that stretch, El Conducto starts to look like this as the terrain gets rougher and the canyon deepens on the left. Then one encounters this little span. I was looking down on it from the rim of the canyon while taking this photo. This little span makes me shaky because there is an awful lot of air off to one's left. Here I am standing on that little span in order to give you a better view of all that air off to my left. Here is a view of that little span from a different vantage point. It is a trouble spot, but I am able to do it. Ever so slowly. The real problem area is an even shorter span ahead just around that corner. I will show you that in the next installment. This photo is only kind of an arty one of that area that I wanted to put up. It does not really illustrate anything of further importance about the endeavor to walk the pipeline. I well know that the mountaineers and the free form climbers among the visitors to this blog are having a good laugh about my effort to walk El Conducto over its entire length. It all looks like child's play to them. In fact I myself did some heavy duty mountaineering in my youth. It was at the suggestion of the United States Army in a place called Dahlonega, Georgia. I was 22 years old at the time. However, I did not carry on developing that skill. One cannot leave this sort of thing when one is 22 years old and then expect to pick it up at age 65 and start again right where one left off. So give me a break, will ya, you mountaineers and free form climbers? I am getting better every time that I go out there. What about snakes and other deadly creatures!?! I bet that old path is a perfect hiding place. I bet you're right, Bloggerboy. I did not think about that. Certainly, I will think about it now. Thanks a lot. Also, after further thought I think that I fucked up once again. I believe that they are called freestyle climbers, not free form climbers. I am not entirely sure they are called freestyle climbers, but I am as sure as I can be that they are not called free form climbers. I hope that I have not insulted anyone, people being prone to feel insult so easily nowadays. Why do I not google this issue and settle it once and for all? Because I am not all that interested in what they are called.